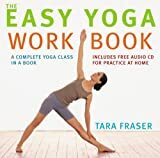 It is illustrated with full-page photographs of Tara Fraser demonstrating the yoga postures, and with many smaller photographs and diagrams throughout the book. The book is spiral-bound, which makes it easy to use. The first chapter, written in simple English, using no foreign or technical terms, explains the benefits of yoga, and emphasizes that everyone can benefit from it. Indeed, the people who are least flexible and fit may benefit the most. The book is intended to help the complete novice learn how to start yoga. Chapter 2 has 22 basic postures, and most of these are included on the practice of the CD. For each posture, there is a short paragraph with clear instructions, and then a smaller paragraph on notes about slight variations or tips on how to achieve the posture. In a side-bar, there's a brief list of physical and emotional benefits of each posture. There are also warnings for people who need to take care -- for example, if you have acute back pain, then you need to be very careful practicing the forward bend. Chapter 3 is a companion to the second chapter, showing variations of the postures for people who find difficulty achieving the standard versions. So, for example, with the forward bend, Fraser lists 3 possible problems people have with the posture, and solutions to them. So, for example, if someone cannot bend forward lower than to touch his knees, then Fraser suggests using a wall, and pressing hands shoulder-width apart and straightening the legs. Each solution is illustrated with a clear photograph. A good number of the modifications involve using a strap or shallow yoga blocks. Chapter 4 on relaxation discusses the benefits of letting go of tension and breathing fully. It also has some simple meditation exercises. The final chapter sets out the benefits of various yoga postures for different kinds of sports. The CD is about 76 minutes long; Fraser (who is English) directs the listener through an hour long workout, followed by a ten minutes relaxation and a short meditation. The whole package is made well: the photographs are nicely done, the writing is clear, and the instructions are thorough. The postures are well chosen and they are indeed easy to do -- most yoga positions are as hard as you want to make them, so it is also possible to make them more challenging. For anyone who is curious about yoga and yet looks at it with some trepidation, The Easy Yoga Work Book would be an excellent way to start. Having an accompanying audio CD makes this one of the best available packages for those new to yoga.